Did a quick search for power taps and am coming up a little empty. Long story short, a very good friend of mine and fellow SCI member, Craig Straub, passed away in Jan '16. Craig built a permanent 4 lane Ninco plastic track that I estimate is around 100' long. The track always had a few power delivery issues (low power dips, etc.) with the track and we had planned on re-wiring the track together before he became ill. In the time since his passing, I have taken on the task of checking and re-wiring his track with the end goal of doing it right once and for all - the way we always planned on. We still occasionally have big race days and having as much of trouble-free track as possible is what I'm shooting for. 1. Buy the Ninco track booster cables (#10314) for each of the taps. Pros: easiest way to tap the track and also remain modular (can move tap easily if needed). Cons: expensive and not sure if worth it. 2. 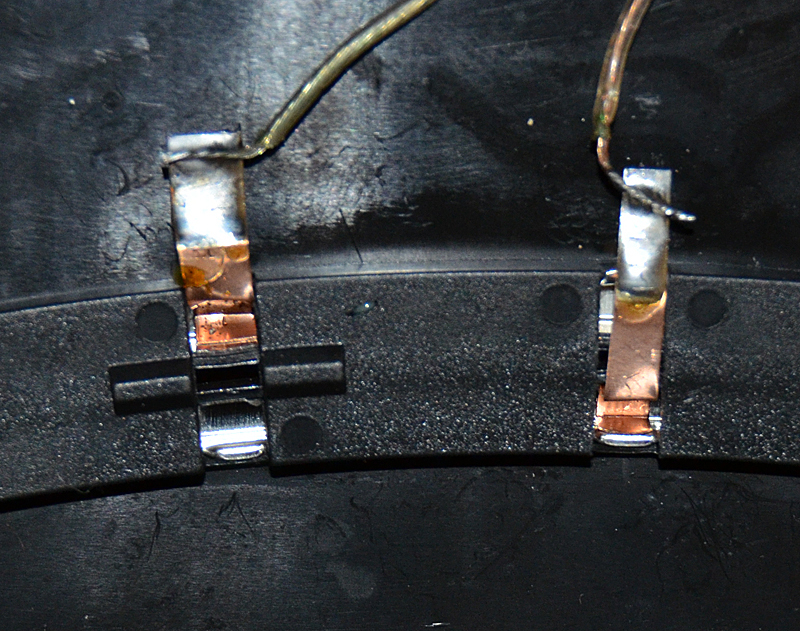 Instead of soldering the wire directly to the rails, strip a section of wire 4-6" long and shove down the rail and then hold wire in place with silicone where it exits the track. My thinking is that the wire will make contact with the rail in multiple places and will keep contact with track movement, etc. Silicone will provide a secure but flexible joint to secure the wire before it snakes down under the table. Pros: cheap and easy. Cons: not sure if it's a good course of action. 3. I'd also like to integrate a quick disconnect setup while redoing this track. I'd like to have the taps hang down about 3-4" under the table and join the rest of the wiring through bullet or spade connectors. This way if the tapped section of track needs to be removed, I can do so easily instead of snipping wires and needing to re-solder. I know this will create additional resistance in the track, but I don't think it's enough to make a difference overall. Any tap methods for Ninco better? I have a Carrera track and while I see similarities between the two brands, I'm not fully up to speed with what works and does not for Ninco. Here you go. I have a skid pad made of Ninco track sections and this is how I did the taps. I made them out of K&S phosphor bronze sheet.